Patriots DE Jabaal Sheard, ankle injury, questionable to return. Thrusts Rob Ninkovich & Chandler Jones into full-time roles, not rotation. Chung has been on Hilton almost exclusively here in the second half. Did that happen? What was that? Good heavens. What. Was. That. I know you have to coach differently when you play the Patriots, but that was just straight out nuts. Jim Harbaugh's like, "That's the dumbest punt thing I've ever seen." The Patriots practiced that on Saturday. That was the single-dumbest thing I've ever seen in a lifetime of watching football. Colts tried to outsmart everyone. Instead they outdumbed themselves. I'm so glad that happened. I was kidding. They didn't practice the one guy taking a snap and trying to beat 2 guys on fourth down in 4th quarter play. 1. How long did they practice that, not knowing it was against the rules? 2. Same questions, minus first two words. 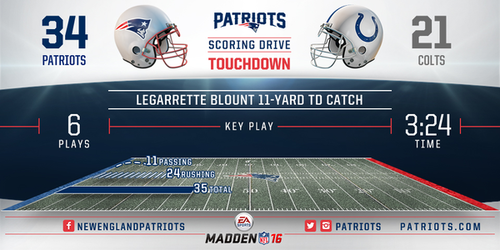 TD to Blount. No flags. The third "Brady! Brady!" chants of the night have erupted here. BRA-DY BRA-DY chant here quickly drowned out by boos. You're telling me the Colts are going to lose their biggest game of the season on a snap from Griff Whalen to Colt Anderson? Colts gave the Pats a short field in a huge moment with that nutty special teams decision. HUGE mistake. The @patriots kick is good. I wonder what type of banner the Colts will raise after this one. Patriots RB snaps early in fourth quarter: Dion Lewis 34, LeGarrette Blount 21, James White 1, Brandon Bolden 0. Blount making his 21 count. On special teams miscue by Colts, notable that Patriots are under first-year special teams coach Joe Judge. His unit adjusted accordingly. After that LeGarrette Blount TD catch, some "Brady! Brady! Brady!" chants heard in Lucas Oil. Then Colts fans respond with chorus of boos. After all that self esteem they built up in the first 45 minutes.